This power-sector CIO seems nothing short of a wizard when we look at the spells he has been casting. What makes him 'power-ful enough? INDIA: Anyone who has passionately devoured, or alternatively, just overheard a huddle of Potter-philes; would not have escaped being awestruck at the mysterious clock that the Weasleys possessed. The family, as described more vividly in Harry Potter series of course, has this special clock in their home, the Burrow. The clock has nine hands – one for every member of the family and naturally it is made for things more important than just telling the time. This magically-potent clock reveals the location or status of each family member whether it is Home, School, Work, Travelling, or even – Lost, Hospital, Prison, and Mortal Peril. Right here in India, there is someone called Prasenjit Mukherjee, GM IT, BSES who could have, in all possibility, torn this very page out of the book quite seriously enough. Because what he is doing at his utility company is something strangely similar – tracking where is ‘this one’ and ‘that one’ going? Curious about ‘these ones’? Let’s take you on a quick broom-ride. It must be a novel thing to hear of terms like Building Energy Management Systems (BEMSs) or Smart grids or Automated Metering but the whole cycle of energy visualization, energy analytics, demand response and property management, has been only on a rise and Navigant Research pegged it to touch an annual revenue of some $5.6 billion in 2020. Does that apply well for India? The question must be something else – Should it? As per CEA’s annual Load Generation Balance Report (LGBR) for the year 2014-15, India saw a capacity addition of 17800 MW during the year 2014-15 comprising 14958 MW of thermal, 842 MW of hydro and 2000 MW of nuclear power stations has been considered. The country has been rubbing shoulders with best names when it comes to generation capacity and also in its pursuit of alternative fuels. The gross energy generation in the country has been assessed as 1023 BU from the power plants in operation and those expected to be commissioned during the year in consultation with generating companies/ SEBs. The country is very well expected to experience a peak shortage of 2.0 per cent and energy shortage of 5.1 per cent. The peaking shortages are likely to prevail in the Northern, Southern and North-Eastern Regions to the tune of 1.4 per cent, 22.2 per cent and 12.9 per cent respectively and surplus energy is anticipated in the order of 1.0 per cent and 14.5 per cent in the Eastern and Western Regions respectively. India yet again, stands at an irony. On one hand, we are growing our generation muscle and on the other side, distribution companies still resort to regular load shedding and intentional for demand management and covering up bills to power generators as revenue collection falls short. When India has almost doubled its energy generation in the past decade by adding over 85 GW of capacity, its old and inefficient distribution and transmission network lost more than 30 GW of this generated power, as per a study. This pile of negligence or weakness in the fundamentals of utility sector has been only growing – from about 15 per cent up to the year 1966-67 to about 23 percent in 1998-99. As per a TERI report and also by CEA (Central Electricity Authority)’s indications, in India, average T & D (Transmission & Distribution) losses, have been hovering at 23 per cent of the electricity generated. Look closer and we can see that these losses run as high as 50 per cent in some states. The power transmission and distribution losses are expected (hopefully, to be precise) to come down to 18 per cent by the end of 13th Plan period from the current level of 23 per cent, as what the CEA has assured in a recent update. Nevertheless, lack of proper accounting of electricity consumption at various stages remains a big malaise. The reasons do not slip as easily as units of electricity being lost. They come from the pattern of energy use, intensity of load demand, load density, and capability and configuration of the transmission and distribution system, substantial energy sold at low voltage, sparsely distributed loads over large rural areas, inadequate investment in distribution system, improper billing and high pilferage. But different parts of the world have already been fiddling with new systems to plug these leaks with an understanding of the magnitude of technical and commercial losses and firming up accurate energy accounting. When energy consumption is broken down into all its components and various categories of consumers, there is natural accountability and efficiency that flows in. Many state utilities were mentioned in a report as organizations which had started implementing R-APDRP smart metering initiatives for bringing T&D losses down under 15 per cent. Globally, the smart electric meter market has shifted emphasis to projects in Europe and Asia Pacific and smart meter vendors reported business activity to be increasing in Western Europe, where utilities in Spain, France, and the United Kingdom have projects underway or about to begin that will account for some 93 million new meters by the end of 2020. In Eastern Europe too, utilities have stepped up plans for smart meter deployments. In Asia Pacific, utilities in China, Japan etc are also installing large numbers of smart meters as part of a five-year nationwide plan to upgrade grid infrastructure and according to Navigant Research, global revenue from annual smart meter shipments is supposed to grow to $6.6 billion in 2023. That’s why when Mukerjee thought of AMR (Automated meter Reading), no matter how odd it sounded for a legacy-dominated sector like this, he was not only confident and hopeful but also mercilessly-determined in swiping off this ‘loss’ epidemic that still casts Indian power scenario under its spell. He knew well that the prime source of revenue generation is supplying energy to registered consumers and billing him/her based on his/her energy consumption. However the billing source is metered and based on these meter readings the consumer is billed. He could see that there was a big need to audit and keep track of energy flowing into its network (which it is purchasing) vis-à-vis energy being distributed (sold to consumers and billed). That’s how he went ahead and boldly deployed AMR. A ‘Clock’ of sorts that would tell him and the leaders where are things going after all and hence equip them in time to fix the leaks and unwanted meanderings. He did that and nabbed many feet going astray (we will tell you how in a bit). That incidentally reminds us to have a look at where Mukjerjee’s footprints have been all this while. A frequent speaker at energy forums and a courageous mind when it comes to trying out fairy-talish ideas, Mukherjee cut his teeth in the nuances of operations early on. As a manager for IT Projects at a software company from 1992 to 1996, a Business Development Manager till 2002, as Manager – Presales (Technical) at an IT major till January 2003 to Head Operations upto April 2004 at another company, he has traversed almost every nook and corner or where and why operations succeeds (or vice versa). Since joining BSES Power Ltd., New Delhi. (Reliance Power Transmission Ltd./ Reliance Energy Trading Ltd.) from May 2004, he has been applying a lot of that wisdom and his own signature valiance on trying radical initiatives. AMR could have sounded as too early a concept but Mukherjee demonstrated a tangible ROI soon enough, for instance. This project impacted business, customer care, technical operations & monitoring and regulatory compliance. It affected on immediate cost benefit derived by implementation and also showed quantifiable impact on revenues as well as interest gained through early revenue realization, cost efficiency improvements, theft reduction, and quick cost recovery windows. His métier is full of many other examples that iterate that any industry, no matter how much grey it is perceived, can actually try and play with new colours, and with sure-footedness. A recent project implemented in 2014 titled “ESSENTIAL” (Enterprise Security Solution for Encompassing Network Trust and Information Availability on LAN-Internetwork), is a good example of how the industry needs to crucially re-consider its comfort zone and move on to new schools of thought. “In a large enterprise like ours where we have large number of IT assets and their users, in a dispersed widespread geographical location, accessing our business applications and databases, coupled with Internet through wired, Wi-fi and internet links, it becomes highly pertinent to have a strong Enterprise security architecture. As any other enterprise, since years we have been using numerous security appliances for firewall and anti-virus, anti-phishing, anti-spam, web filtering services to mitigate security threats and risks. Further we wanted a device for worm mitigation and malware protection. Since business data is stored and housed on IT network, it is important to protect not only business data, but data belonging to customers and clients as well.” Mukherjee explains ESSENTIAL in a nutshell. The value generated from this project was envisaged while conceptualizing it itself the module soon started providing intelligent threat defense and secure communications services that stop attacks before they impact business continuity. This has helped the organization to securely deploy mission-critical applications and networks in a highly reliable manner, while providing significant investment protection and lower operational costs through its unique, modular design. The project also raised the levels of employee productivity and operational efficiency by securely connecting mobile users – while information is secured, audit trails are kept, and hackers are kept out of the network. “Further the process cannot be disabled by human error or malware. It is an innovative step as we have moved from a traditionally handled collection of separate boxes into a single modular box which can handle the huge enterprise load and further provide a highly secure environment. Further this was a green initiative for a large enterprise like ours.” He emphasizes on some high-voltage benefits. PALMS (Power and Load Management System) pops as another initiative that Mukherjee and his team set their hearts and adrenaline upon. When the electricity demand was going up constantly, it called for improvement in efficiency and innovation and that’s where IT driven operational excellence turned up as critical to success of a distribution company. “Power purchases ranged 70 to 80 per cent of the total input costs and were a huge concern for a discom. Hence a well thought out strategy can, not only improve the profitability but also can enhance the customers’ satisfaction. Accurate models for power utilities load forecasting are essential to the operation and planning of a power utility. However, the electric load forecasting problem is not easy to handle due to its non-linear and random-like behaviors of system loads, weather conditions, variations of social and economic environments. Hence the scope involved Creation of Energy Demand Forecasting Repository , making data available, data accumulation interpretation and adjustment, explore and diagnose data, develop demand forecast model, Forecast reviews and adjustments, customize demand forecast reports.” Mukerjee encapsulates. These and many more other projects like EDGE (Enhanced Data Generation for Enterprises) and CORE (Converged operations and reporting engine) exemplify that the right CIO vision can make a lot of difference in refreshing a laidback vertical. Impacts of this project were seen in the form of fast & efficient resolution of the Consumers’ complaints/ queries/ problems; drop in faults and outages and business targets being met. “Further a satisfied customer brings in more business.” That could have brought in a lot of much-needed edge for an organization that emerged after the unbundling and privatization of the erstwhile Delhi Vidyut Board, having acquired an equity stake of 51 per cent in two of the three distribution companies, and entered Delhi on July 01, 2002. BSES manages power distribution in the areas which fall under South, West, Central and East of Delhi and under Mukerjee’s clever mapping strategies, it seems to be headed in the right direction in creating all that magic and lights that India desperately needs. What makes him an Influencer? It’s not just about creating business gains and recovering ROI figures, but what makes an avant-garde CIO quintessentially so is his ability to get a fine and tight grip on any vertical’s innate challenges. 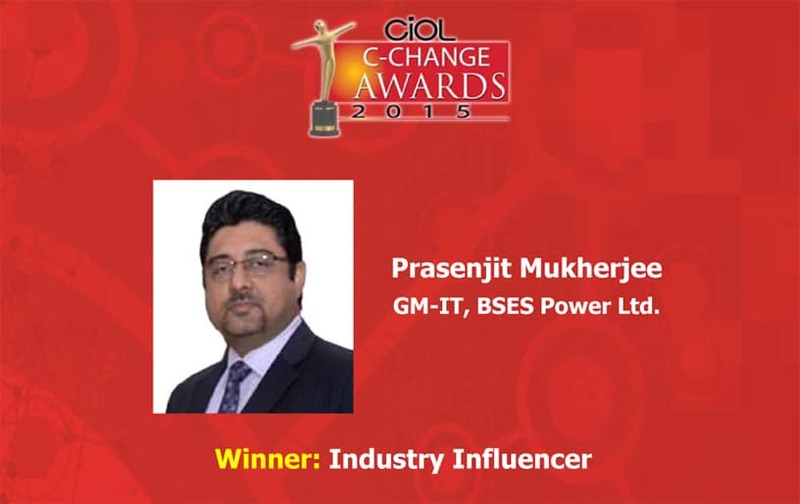 Mukerjee has not only been striving to attack T&D losses, outages, faults, errors and metering goof-ups that this sector is usually plagued with, but he is also simultaneously creating a new image, credibility and charm that customers of this industry are not otherwise used to. That, in short, sounds like another Potter Tool – The Marauder’s Map. In the story, this magical document reveals all the school’s layout, every classroom, every hallway, and every corner of the castle, all secret passages, all hidden lanes within its walls and the location of every person in the grounds. That big-picture view and a surreal ability to see an organization’s strong and weak areas so objectively, certainly imparts him with some magic.